Dylan, Renee and Griffin are the family behind @pleadingthefifth_wheel, and they believe life is better lived in less than 350 square feet. 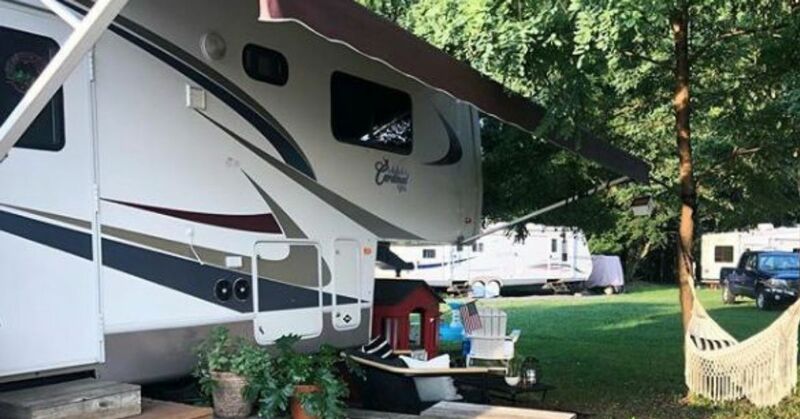 The family renovated a fifth-wheel camper into a compact, luxurious home that offers all of the needs for modern living and easy accessibility to the great outdoors. Renee is a stay-at-home mom to their son, Griffin, and Dylan is a Naval officer, which means moving every few years. Instead of packing up an entire house each time, the couple decided living minimally was the way to go. With a shoestring budget of $3,000, the family renovated the camper in a bohemian, modern farmhouse style, complete with shiplap trim and an bright, airy aesthetic. Multi-use furniture has been the key to thriving in such a tiny environment. This bench, where Griffin sits for dinner, doubles as a storage ottoman, sofa table and footrest. The faux snake plant serves as a tiny table with just enough room for a coffee cup, and a boho storage ottoman secretly stashes Griffin’s toys. The living room’s built-in fireplace offers subtle storage flanking the stone hearth. Renee painted the brick facade in an all-white palette, accessorizing with a macrame wall hanging and pops of greenery. In the kitchen, a statement pendant light fixture from World Market offers a pop of interest over the all-white design. White subway tile serves as a clean, modern backsplash above the range. The island and sink features cabinet storage underneath for sneaky added space. The bedroom features a white-and-gray color palette to keep the space open and airy, along with its accompanying sink and vanity, while textural throw pillows offer depth and interest. Cabinet storage at the foot of the bed offers room for clothes and books.